Stamping & posting in a rush tonight, trying to beat another storm that is coming. My stamp room is upstairs in our two story house that sits alone on a hill-not a place to be when the weather isn't looking good!!! 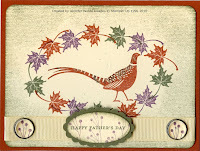 I got two cards made though, here is the first for the Create with Connie & Mary Challenge of the week-Father's Day. Card base is the new Cajun Craze. Coordinating colors by the Color Coach, Perfect Plum & Always Artichoke. The background layer is Confetti Cream textured with the wood grain like texture plate and craft frame so that the center is not textured. The pheasant was inked with Cajun Craze, then thumped with the Perfect Plum & Always Artichoke markers. It kind of blends all the color together, but it also breaks up the solid look of the Cajun Craze. The textured was sponged lightly with Always Artichoke. The leaves were stamped with all three colors around the non textured oval. Ribbon along the bottom is Very Vanilla grosgrain with Build a Brad on the edge of each. 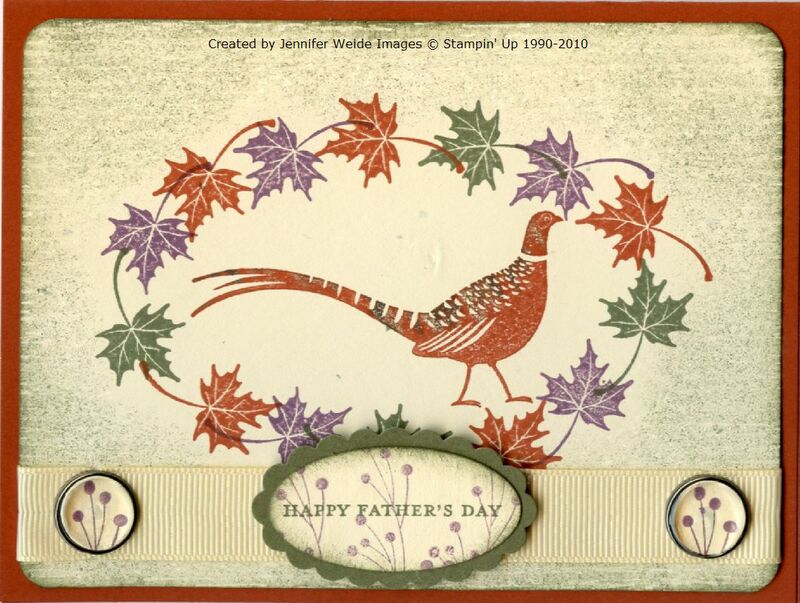 In the center, Happy Fathers Day from Teeny Tiny Wishes on ovals. I missed Fathers Day, but this would be a great Thinking of You or Birthday card as well! Great masculine card! That stamp set is perfect! Love the leaves surround the bird! Thanks for playing along with Create with Connie and Mary this week!